Curriculum Leadership: Strategies for Development and Implementation, Fourth Editionis a one-of-a-kind resource written for educational leaders–administrators and teachers–who want to successfully restructure and enhance school curriculum. 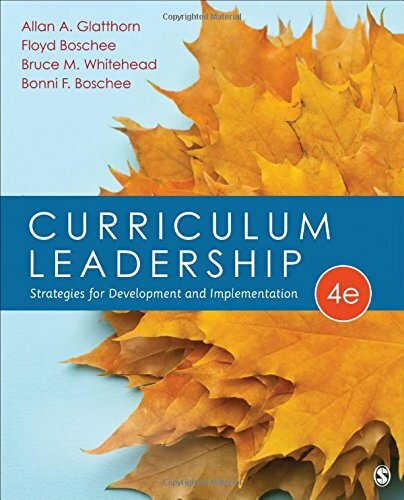 Authors Allan A. Glatthorn, Floyd Boschee, Bruce M. Whitehead, and Bonni F. Boschee provide innovative and successful curriculum ideas, including reflective case studies, “Keys to Leadership” sections, curriculum tips, and “Challenge” sections with key issues and questions in every chapter. Also interspersed throughout the book are tried and true strategies that provide administrators with innovative ideas on meeting state and national standards. This is a much needed, highly informative, and easy-to-read account of curriculum development and change for curriculum leaders, those teaching curriculum courses, and those aspiring to become curriculum decision makers. It provides the knowledge and skills needed to develop and implement a PK–12 school curriculum.